The shoreline is a highly dynamic land-sea interface that provides important services such as ecology, flood protection and recreation. It is constantly modified by wind, waves and tides, and impacted by human activity. Hence, the decadal change of shorelines reflect natural processes as well as human influence, whether positive or negative. 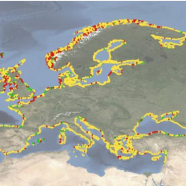 Climatic-driven changes such as sea level rise, higher waves and changes in wind direction put increasing pressure on many of Europe’s shorelines. Knowing how, and at what rate, our coasts are changing is the first step to successfully managing them. The new EMODnet Geology shoreline-migration map, released today, allows users to visualise pan-European coastal behaviour for 2007-2017 at different spatial scales. A built-in search and zoom functionality allows online users to distinguish areas of landward migration (erosion or submergence), stability, and seaward migration (accretion or emergence). The underlying, downloadable satellite-based dataset offers additional information on annual values and uncertainty. Click here to view/download the file.